Please mark your calendar for December 9, from 4-6 p.m. 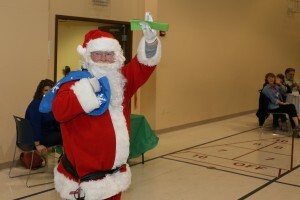 The St. Regis Park Holiday Party will be taking place at Saint Andrew UCC, 2608 Browns Ln. Join your friends and neighbors for pizza, subs, snacks, music, and door prizes. There is no cost for citizens to attend this event. Don’t forget to bring your cameras for pictures with Santa!! St. Regis Park Citywide Yard Sale - Saturday, September 8th 8 am until ?? Police Officers will enforce traffic regulations and extra police will patrol this day! No parking signs will be placed on the same side of the street as the fire hydrants. As I write this, the Oaks and Derby have just concluded and it’s been another excellent time of year in the Bluegrass State. I want to make sure that everyone knows, especially new residents that have recently moved to our city, that we have no-parking signs available for your use. I appreciate those who called the city and asked to borrow them for their Derby parties. It really makes traffic flow much more easily when these signs are used. As families get together and yard sales approach, please make sure to contact City Hall in order to borrow the no parking signs. As I mentioned in last month’s newsletter, The McMahan Fire Department is merging with the Jeffersontown Fire Department effective July 1st. The J-Town Fire Chief, Sean Dreisbach, attended our Council meeting and introduced himself. While speaking, he confirmed that there will be no decrease in services - only increases. Jeffersontown will be working to possibly add a new ambulance dedicated to the Taylorsville Rd. location (McMahan/JTown). They will also be working to make sure there are additional firefighters trained in Advanced Life Support (ALS). Chief Dreisbach did mention that they are planning to transition the white fire trucks to green, like the ones that J-Town currently uses. Jeffersontown Fire District’s contact information will be updated in July’s newsletter. Please remember that on June 7th, the Farmer’s Market at St. Andrew United Church of Christ will resume. The market is open Thursdays 3:00 - 6:30 PM. Also, on June 9th there will be a CPR certification class provided at the McMahan Fire Station, 4318 Taylorsville Road. The class is free of charge. It will start at 9:00 AM and adjourn at 1:00 PM. Please send an email to McMahan’s Assistant Fire Chief, Kenneth Amback kamback@mcmahanfire.com to reserve your spot. Remember that this is a life-saving skill. And CPR certification looks great on your resume! As you walk and ride throughout the city this summer, you will notice that it is considerably brighter. Councilman Louie Schweickhardt has overseen a project that is increasing the lumens in all of our light posts. The council and I thought it would be best to increase the brightness of each pole vs. the possibility of adding more poles. This will not only help the safety of our citizens as they walk, ride and drive, it will also help guard against burglary and theft. Last, but not least, I would like to congratulate the Council for having the first reading of our proposed annual budget where we have once again not increased the property tax rate on our citizens. We love being able to have all of the sanitation, recycling, tree board, added police presence and many other benefits of St. Regis Park, all while remaining fiscally conservative. Remember, the City of St. Regis Park is a great place to live. Together, we will make it even better! The annual ST. REGIS PARK HOLIDAY EXTRAVAGANZA will be held on Sunday, December 11, from 4:00-6:00 p.m. at St. Andrew United Church of Christ. Door prizes, refreshments, a visit from Santa and good old family fun and fellowship will occur. In addition, the City will again sponsor what has become an annual HOUSE DECORATING CONTEST. Once more there will be three categories: Best Traditional Home, Most Creative Home and the infamous Clark Griswold Award. Although judges will be looking for “tastefully” decorated homes in the first two categories, the Clark Griswold Award is an all out, no holds barred contest. The winner in each category will receive a $200 gift card. Decorate your home by Friday, December 16, to be eligible to win.